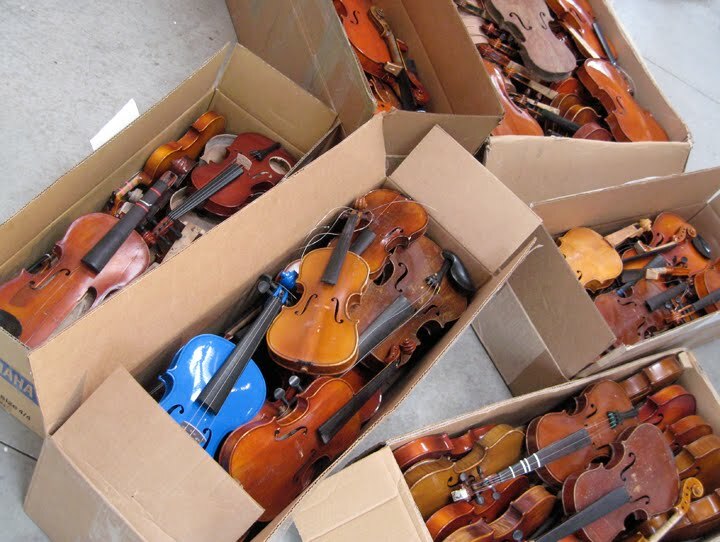 Beginning in September 2009, I contacted violin shops nationwide soliciting damaged, incomplete, or irreparable violins. Over the next eight months I acquired instruments from thirteen states, totaling nearly one hundred violins. Thank you to the following individuals and businesses for generously donating instruments to this project: The Fiddle Doctor, Prescott, AZ; John Kelly, Lexington, VA; Valley of the Suns Violins, Phoenix, AZ; Blackerby Violin Shop, Dallas, TX; Brook Mays Music/H&amp;H Music, Dallas, TX; Lee Dale Nigh, Fulton, MO; J.R. Judd Violins, Williamsport, PA; Strings and Other Things, New York, NY; Bishofberger Violins Ltd., Seattle, WA; Claire Givens Violins, Minneapolis, MN; Ute Brinkmann, Wallingford, CT; Long Island Violin Shop, New York, NY; A Violin Maker’s Workshop, Cincinnati, OH.